Come on, Academy, give Jake Gyllenhaal that Best Actor nomination already! This year, at last, I suspect it actually happens. This is in part due to Best Actor not being the most set-in-stone of affairs (you've got one shoo-in, Gary Oldman, and then a whole boatload of contenders, including Gyllenhaal, Timothee Chalamet, Bryan Cranston, Steve Carell, Daniel Day-Lewis, Tom Hanks and Andrew Garfield, among others, playing jump ball). What I think also helps Gyllenhaal is his latest picture, Stronger, is much more traditionally Oscar-friendly (and, let's be honest, safe) film than the bolder, more idiosyncratic likes of Nightcrawler and Nocturnal Animals. Stronger, the latest effort from director David Gordon Green (whose eclectic filmography manages to include George Washington, All the Real Girls, Pineapple Express and Your Highness), recounts how the unassuming Jeff Bauman (Gyllenhaal) emerges a national hero after losing both of his legs during the Boston Marathon bombing in 2013. After regaining consciousness following the attack, Bauman is able to assist the FBI in identifying one of the suspects. 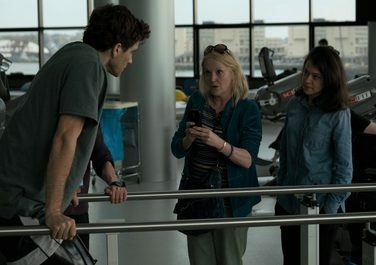 Upon his release, Bauman is cared for by his estranged girlfriend (Tatiana Maslany) and doting mother (Miranda Richardson), who aren't always on the same page as to what is best for their loved one. Bauman's road to recovery, both physically and emotionally, moves a grueling one, as a national spotlight is shone on a struggling man who hardly craves such attention. Stronger is a modest endeavor for the most part, not quite as ambitious or striking as Green's first pictures but for sure more satisfying than his more recent output. What gives the proceedings a crucial lift are the three central performances. Gyllenhaal, per usual, completely disappears into his role and doesn't resort to the twitchy gimmicks that a lesser actor may have resorted to in this role. Maslany's portrayal also has a wonderful, lived-in feel - it's a warm and honest performance from an actress who'll hopefully land many more roles of this quality on the big screen. And then there's Richardson, an inspired choice to take on the role of Bauman's colorful Massachusetts mama, a scene-stealing force right on-par with Melissa Leo's tornado of a matriarch in The Fighter. For these three top-notch performances alone, Stronger (which otherwise isn't all that much to write home about) is totally worth a look.